The artist themes can be customized using your images to create graphics. The fonts, font colors, background colors or background images can also be changed. The basic fee is $950. 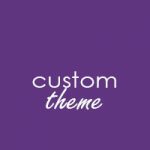 I will provide a written quote for any special design requests and extra content. Along with your custom theme we will install and configure WordPress. We’ll provide enhancement plugins for: image galleries, search engine optimization, backups, social media, contact form, and security scanner, and more. Artbiz will create 10 blank pages for you to start, ready for you to add your content. You can always add more as your site grows. Artibiz will create 3 empty image galleries and link each to one of 3 of the 10 pages. These will be ready for you to upload your images. There is no limit to the number of galleries or images you can upload once you take over the management of your site. There is no limit to the number to images, galleries or pages that you can add once you take over the management of your site. The customizing fees are based on artist’s images being web ready and all copy being supplied. Note there isn’t a form to fill out for this package. This is an one on one process where we will be communicating mostly by email or Skype. Fee’s are invoiced and submitted online. Website Hosting is not included in the design fee.